Slice both ends off the mango, revealing the long, slender seed inside. Set the fruit upright on a work surface and remove the skin with a sharp knife. With the seed perpendicular to you, slice the fruit from both sides of the seed, yielding two large pieces. Turn the seed parallel to you and slice the two smaller pieces of fruit from each side. Cut the fruit into the desired shape. Position rack in upper third of oven and preheat broiler. Line a broiler pan with foil. Arrange mango slices in a single layer in the prepared pan. Broil until browned in spots, 9 to 11 minutes. 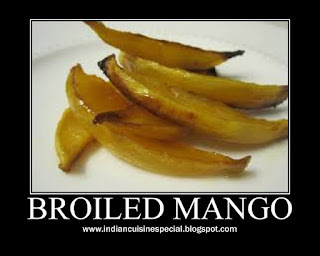 Squeeze lime wedges over the broiled mango and serve.